Do you ever eat Jello with your fingers? I think it is a regional trait- some of my friends have never heard of such a thing, but here in the midwest, we do it all the time! Whether you are a pro or a newbie, you can add a little jiggle to your get-togethers with a fun and colorful Finger Jello Recipe! Fun desserts are one of my favorite parts of throwing a party – they taste good and are so decorative! Our Sparkler Cupcakes for 4th of July taste amazing and also work as a centerpiece for your table! 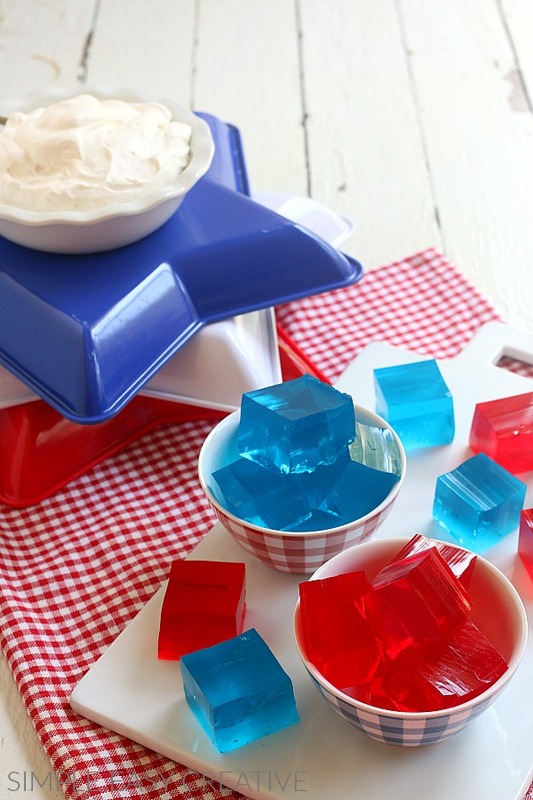 This Finger Jello Recipe is just as fun and even easier to make. Little ones love to help make and eat finger jello and there are no plates needed- just grab a square and enjoy the day. Talk about easy cleanup! What makes Jello so versatile? Jello is so versatile- I love that I can add a little extra fun by tossing in some blueberries and strawberries before the Jello hardens. So when I sneak in a little fruit it becomes a finger Jello fruit salad! 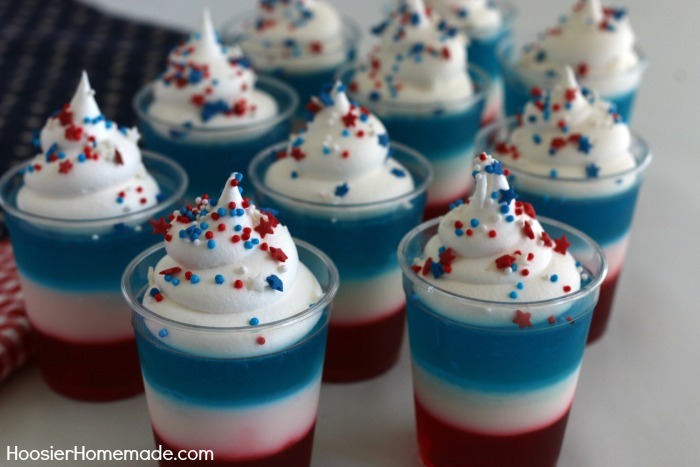 My other go-to for finger jello is adding a little alcohol for the adults for Jello shots, for the 4th of July make it into a 4th of July Jello Shot– just make sure to clearly mark which is which! The other great thing about the Finger Jello Recipe is that it can be used all year and even for other holidays. 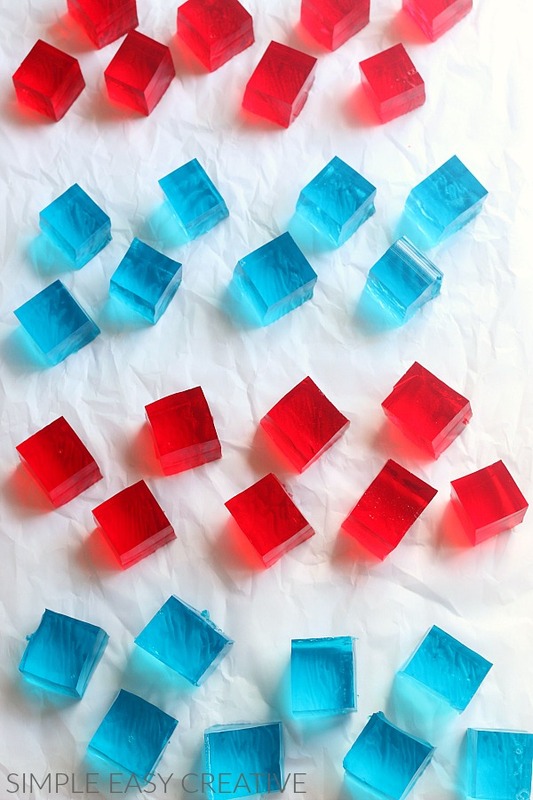 By changing the Jello colors (or even shapes- there are some awesome Jello molds out there!) you have a quick, festive, and fun dessert! It is definitely one of my go-to desserts when I am low on time. 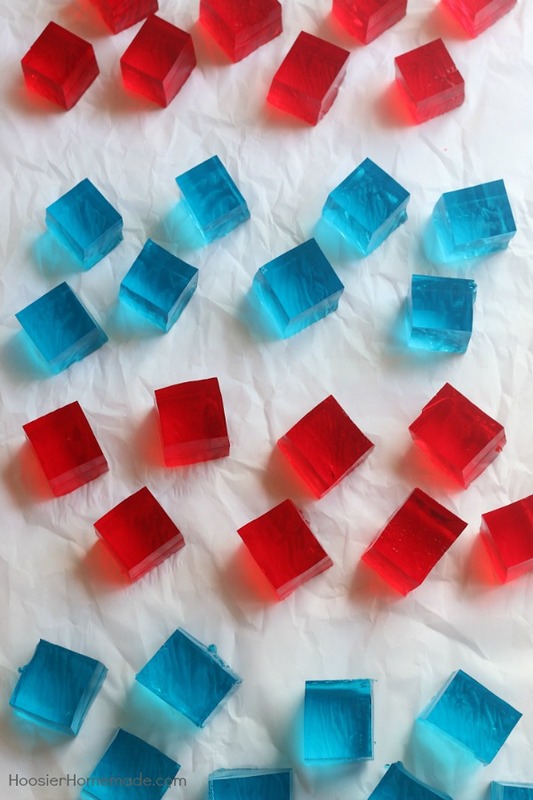 To make 36 squares, I used three small boxes of Jello and unflavored gelatin, all available at Walmart. 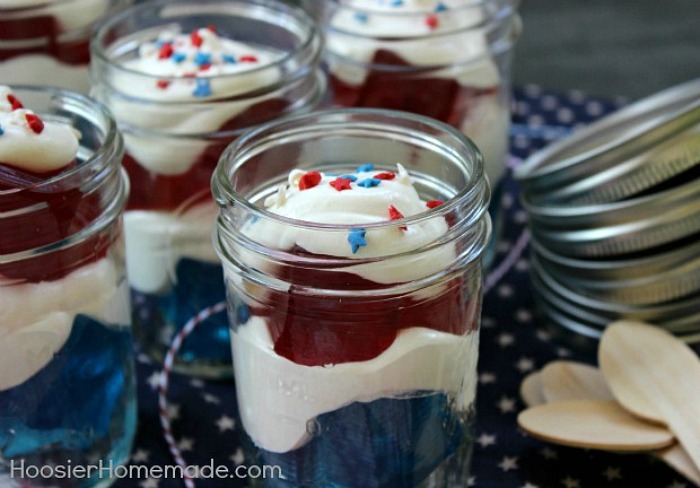 If you have multiple parties going on, be sure to make extra Jello, then you can turn it into 4th of July Treat Jello Parfaits. Nothing is better than two for one! 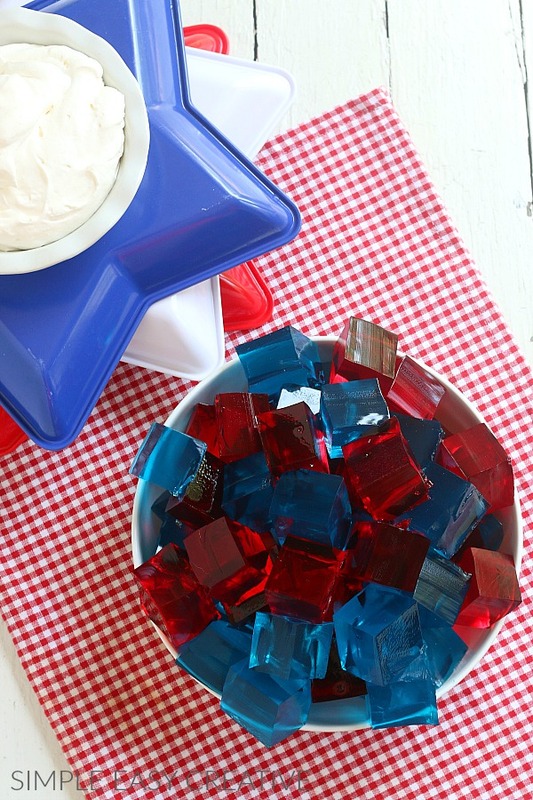 Like I said, I love the 4th- be sure to try our other fun and festive 4th of July recipes! Hope yours is great! Love Jello? You will definitely love these desserts! What? You have never eaten jello with your fingers? Well you are in for some F-U-N! This easy to make Finger Jello Recipe is one that I have made for years, and is loved by kids AND adults! This post contains affiliate links and if you click on these links we might make a little money so that we can bringing more great content to you. If you have any questions please read our disclosure policy. can you just use the flavored jello? and not the unflavored? Hi Rhonda, the unflavored Knox gelatin gives the finger jello substance, it’s different than regular jello. You can use just the flavored jello if you want regular jello, but for the finger jello you will need to use the Knox gelatin or a store brand similar. Can I use a bigger pan other tha n an 8 x 8? Hi Joni, sure a bigger pan is fine. The jello would just not be a thick.